It is important that everyone learns how to talk about and have a healthy body. Words (the right and wrong ones) we use about diet, weight, food and body image may just trigger these risk factors in certain people. Mothers, fathers, siblings–everyone is affected when their loved one is under the grips of an eating disorder’s strong and pervasive pull. 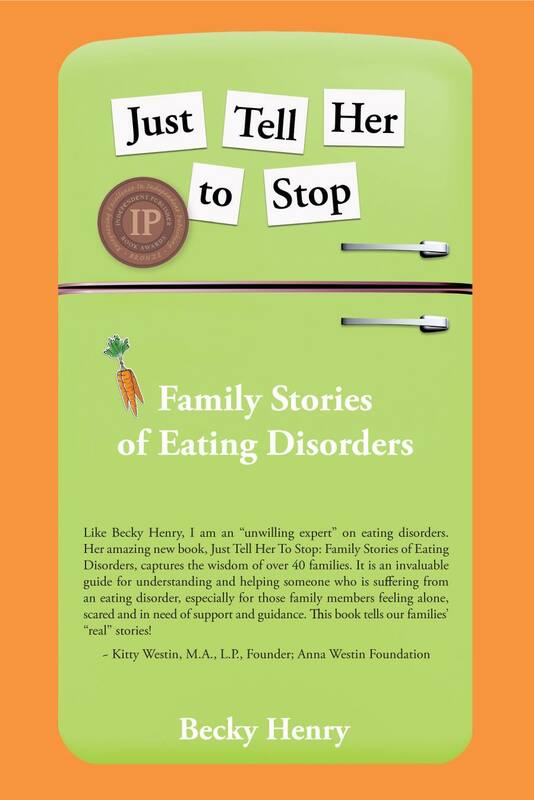 Just Tell Her to Stop is an amazing collection of stories from families who shared what it is like to live with and support a person with an eating disorder. Mothers, fathers, sibling everyone is affected when their loved one is under the grips of an eating disorder’s strong and pervasive pull. Author Becky Henry is an “unwilling expert” learning all she can to try and right the wrongs her family experienced in trying to help a child with an eating disorder. Becky interviewed more than 40 people to tell their story so you know you are not alone and parents are not to blame. The different perspectives are invaluable to any reader to gain skills, insights, tools, techniques and find support. Becky has a passion for educating the world about eating disorders to help with prevention. Educate yourself about the disease and how you might be able to prevent, recognize or help people living with eating disorders. (Professors: Available for students at the e-book rate of $9.97 – contact the Author directly. The tips at the end of each family’s story are most helpful. 1. Prepare for a marathon, not a sprint. 2. Fill yourself up so that you have reserves.